In 2015 Philippe Brunel, well known for his participation on electric guitar in the French group Marquis de Sade, switched to acoustic guitar and formed an band playing his own compositions inspired by the stories told to him as a child by his seafaring grandfather of travels around the world. One finds many influences, from Bossa to Flamenco to Salsa to Irish music, each piece recalling a particular port of call visited in the 1930s by his grandfather. While it is common for artists to describe their music as a “voyage”, in Philippe’s case it is based on actual fact! 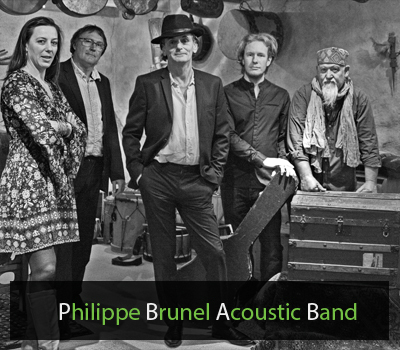 Make the voyage with the Philippe Brunel Acoustic band.